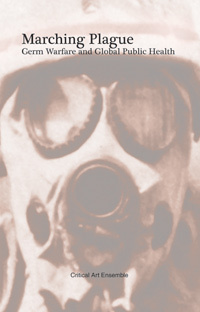 Marching Plague, the long-awaited new book from Critical Art Ensemble, examines the scientific evidence and the rhetoric surrounding biological warfare, particularly the development of anthrax and other bio-weapons, and makes a strong case against the likelihood of such weapons ever being used in a terrorist situation. Studying the history and science of such weapons, they conclude that for reasons of accuracy and potency, biological weapons lack the efficiency required to produce the widespread devastation typically associated with bioterrorism. * Why is bioterrorism a failed military strategy? * Why is it all but useless to terrorists? * How have preparedness efforts been detrimental to public health policy? * What institutions benefit from the cultivation of biofear? * Why does the diplomatic community fail to confront this problem? The book concludes with a brief examination of the actual crisis in global public health, arguing for the redirection of health research away from the military, and promoting a number of strategies for civilian-based preparedness and education. The conditions from which Marching Plague emerged are nothing short of bizarre. Originally scheduled to appear in 2004, the manuscript was in the possession of Steve Kurtz—one of the text's collective authors—when he came under the intense scrutiny of the Justice Department and the FBI for suspected biological terror crimes. Made paranoid by their own rhetoric, the Feds failed to tell the difference between an art piece scheduled for installation at the Massachusetts Museum of Contemporary Art and something more nefarious. Kurtz' house was sealed off, his research was taken (including the manuscript and his computers), and his colleagues and publisher were subpoenaed, all for some trumped-up charges of mail fraud. Two appendices in the book comment on the political ramifications of Kurtz' trial, and what it means for the culture of dissent in a time of authoritarian political life. CAE provides readers with a sober assessment of the interests animating many-headed corporate bureaucracies and the showy illusions they project. More than that, CAE’s theoretical ideas are grounded in the lab work of their practical experience and experiments in art and culture. CAE has continued to do their work facing overwhelming pressure from law enforcement. This book is a testament to their commitments advocating freedom of research and the liberating potential of autonomous creative labor. The book "Marching Plague" is published under anti-copyright licence, therefore any non-commercial use of the book is welcome. Still, if someone likes to have hard copy of the book, it could be ordered here. Share Marching Plage via demonoid or karagarga(or download it here).